Believing is hard. Painful trials and confusing circumstances tempt us to doubt the promises of God, pushing us toward disappointment and despair. In this encouraging book, Jon Bloom, president and cofounder of Desiring God ministries, bolsters our confidence in God through imaginative reflections on 35 stories from the Bible. The examples of characters such as King David, Zacchaeus, and the Apostle Peter challenge readers to trust God over and against their unreliable perceptions of the world. These creative and devotional meditations highlight God&'s trustworthiness seen in the stories of the Bible and explore practical implications for everyday life, helping readers find rest in the faithfulness of God. Jonathan M. Bloom, Norma Jean Calderwood University Professor of Islamic and Asian Art at Boston College. 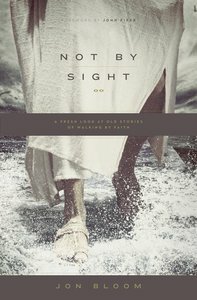 Customer Reviews For "Not By Sight"
This book is a compilation of stories that really personalise the bible stories we know well. They have helped me see the events in new ways and made the stories personal and relevant. Easy reading and inspirational. I have given several of these as gifts. Highly reccomended.